If you are looking for some great (free) information about walking poles or just to read what a local champion has to say about them, let us introduce Mox. Norman (“Mox”) Moxey is a mechanical design engineer and bushwalker who is involved in the design and development of outdoor adventure equipment. “Mox” is associated with the ultra lightweight specialist firm, DAC Featherlite, who produce Helinox brand walking poles. He makes presentations to bushwalking clubs and other groups to explain the techniques of walking with poles that produce most benefit for the bushwalker. We think he has a very important message and invited him to share his thoughts. I was good at school and my mum wanted me to be a doctor. I hated the sight of blood and became an engineer. I’m now involved in advanced lightweight design with Helinox and I help people by explaining how to use poles to get more health and fitness benefit from their bushwalking. I’m not a doctor, but my mum would still be very happy. Australian bushwalkers are realizing that there’s a lot more to using poles than just avoiding a fall at that creek crossing. For most of us, walking is an important part of our exercise. We know that walking increases blood flow to help prevent heart disease, and most of the other things we’d like to avoid. Attitudes to trekking poles changed dramatically when the Cooper Institute found that using poles when walking boosts blood flow by a further 20%. Research also indicated that the extra blood flow doesn’t require greater exertion, in fact using poles makes it seem easier. Suddenly 10 million Europeans are using poles and sales are soaring in the US. But the benefits go beyond engaging the upper body muscles to increase blood flow and make walking easier. Keeping our ” wearing parts” in working condition has become a big issue. 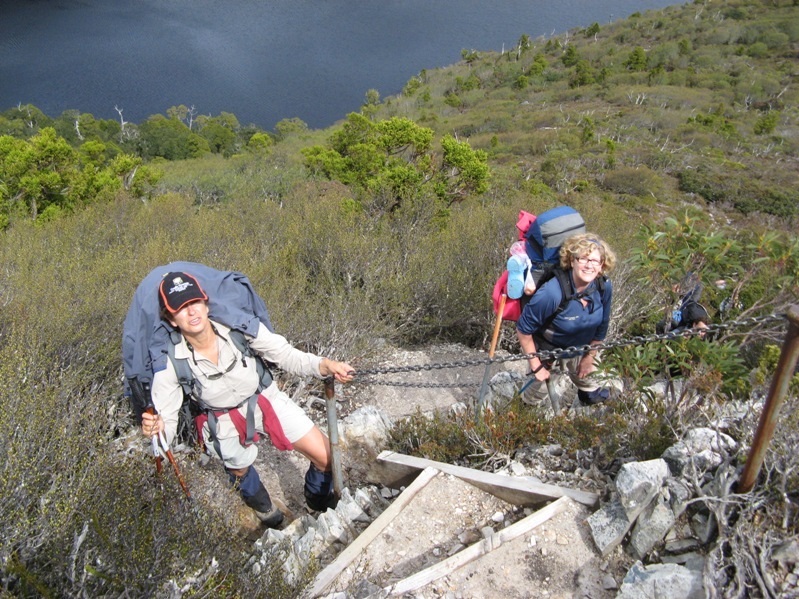 I meet too many people (many young and otherwise very fit) who are concerned that their bushwalking might soon end because of knee, feet, ankle or hip wear and damage. A nice part of my job is helping them ease the pain by explaining how to use poles to reduce stress loads. It doesn’t take much thinking to work out that those same stress loads are what caused the wear and damage to the joints in the first place! The best part of my job is helping bushwalkers avoid premature joint wear and injury. Walking with poles to reduce stress loads on the lower joints is the key, but the important part is technique. It’s simple. It becomes obvious once shown, but it’s NOT instinctive and it needs a little explanation. That’s why we produced an illustrated booklet to explain how to use poles for maximum benefit. It was only intended to be supplied with our poles but we’ve been asked for spare copies and now we make it freely available to everyone. I sincerely hope the information is helpful to you . . . and so would my mum”. Disclaimer: Mox contacted us to discuss advertising on Our Hiking Blog. We read the guide and think it is a fantastic resource. 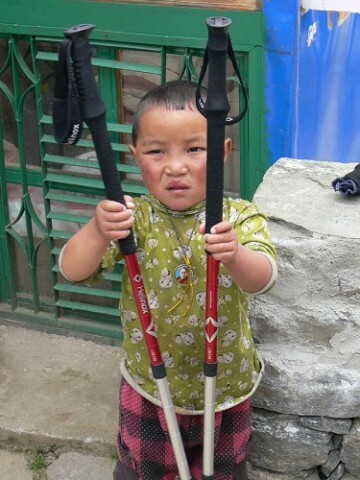 Following a long phone chat he offered us a couple of pairs of Helinox walking poles to try out. They have arrived and at first sight look the goods. The plan is to try them out and get back to you with a review. We feel another video coming on, look out! As a person who has had a prolapsed disc in my lower back and bushwalking is a real passion. This was one area of my life I didn’t want to have to give up, I was recommend by my phyiso to get a pair of walking poles. It has helped so much when carrying a pack. 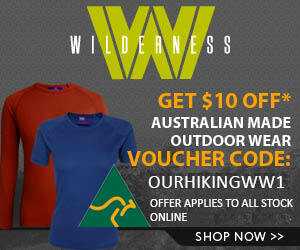 They will be getting a work out on the Overland Track in Oct. I did much bushwhacking in the past. A wood walking stick fit the bill for me. I got the balance and traction, and the feel of nature to boot. Interesting product you have there. Do you make them all your self? Interesting company promoting e-mail there Frank. I did download the PDF from Helinoxs’ web-site for a read. I have had my Komperdell C3 Carbon Trekking Poles for many years now and the duolock has never been a problem – contradictory to what Helinox are saying about screwlocking devices in “older style” poles. Komperdell – a leader in the field of trekking poles STILL use the duolock system –and you can get a pair for AU$ 97 (Sierra trading post) – much cheaper than Helinox’s top of the range poles. Everybody who uses poles knows how walking through scrub is a pain with poles – wouldn’t having a height adjusting leaver be a magnet to twigs and leaves snagging it?? Have a problem with their reasoning about averting back pain because of the load on your “Bent Spine”! If you aren’t carrying the majority of the weight via your hip-belt – then you have not setup your pack properly. All the facts and figures used by Helinox have been around since “Adam” was a lad – and I have quoted them many a time to the non-converted. I have been singing the praises of trekking poles for ages. Contrary to what Helinox say – I have a cheap pair of Aldi poles ($19) that I use for training, and they do a marvellous job! Another use of poles is for defence. Whilst walking the Coast to Coast walk in the UK, I had to use my poles to fend off a cow that didn’t like the fact that I had come between it and its calf. The only thing that I don’t like about Trekking Poles is the idiots who buy them and have to poke them into every ball of moss on the Overland track!! Well that’s my two bob’s worth! Interested to read about the Komperdell poles. I have honestly not come across them before. They seem to have given you excellent service! Agree about the pole holes on the OT! Cheers and thanks for taking the time to comment.